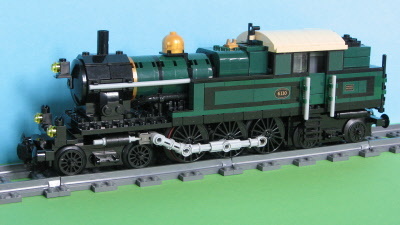 NS 6100 Steam Locomotive for Power Functions. NS Class 6100 steam locomotive of the Dutch Railways. 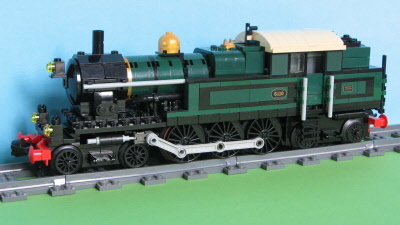 The building instructions are very detailed and show step-by-step the building of all versions of this locomotive. In order to build the set you need the Power Functions set consisting of the PF train engine, battery box, and IR receiver. The Power Functions Set is optional/not included. Almost all parts are brand new (only 10 are used, but in good condition). The set includes 8 special printed bricks (e.g. bricks with the engine number). The set is available in different versions. First you can opt for red buffer beams (like in the real engine) instead of the standard black ones. Secondly you can opt for slender custom driver rods instead of the thicker composed ones. The Dutch Class 6100 steam locomotives were built in 1929. In total 10 of these so called Tenderjumbo’s were built . Five by the German company Hohenzollern and five by the Dutch company Werkspoor. They were designed for running heavy passenger trains between Amsterdam Central Station and neighbouring towns like Hilversum. The later series (3816-3820) of the classic Dutch Class 3700 was used as an example for the design of this locomotive. Some numbers: The Class 6100 could carry 12 m3 of water and 4.3 tons of coal. The overall weight is about 108 tons and the engine measures 16.3 m in length. The engine has 4 cylinders with a relative high diameter of 420 mm for a high traction force. The maximum speed is 90 km/h (later increased to 110 km/h). The Tenderjumbo’s were specially designed for running heavy passenger services as easily in forward as in backward direction. In practice however they were turned if possible. One of the main reasons was that the driver was on the left site of the engine when driving backwards, while all the signs were on the right side of the railway. In practice the Jumbo’s did not run passenger trains solely. Shortly after they were taken in operation they also started running coal trains. In general the Tenderjumbo’s served good, but were unfortunately limited in number and could therefore not contribute much in the work they were designed for. During World War II two Jumbo’s were damaged severely and scraped shortly after. A third one stayed in Eastern Germany. The remaining 7 Jumbo’s served until the late Fifties. In 1958 the last Tenderjumbo (no. 6108) ended serving. All engines were turned into scrap. Only some number plates remained. However in the book “”Stoomlocomotieven NS-serie 6100, De geschiedenins van de Tenderjumbo’s” (ISBN 907151343-2) you can find an awesome lot of details and photos of these beautiful engines. PF-parts are not included / optional.